Rachel is driven and motivated, using her passion for communication and account management to establish and strengthen positive relationships with both clients and coworkers. Before joining the Plan B team, she worked as an account coordinator at a Milwaukee agency with clients such as BOSS Snowplows and MillerCoors. 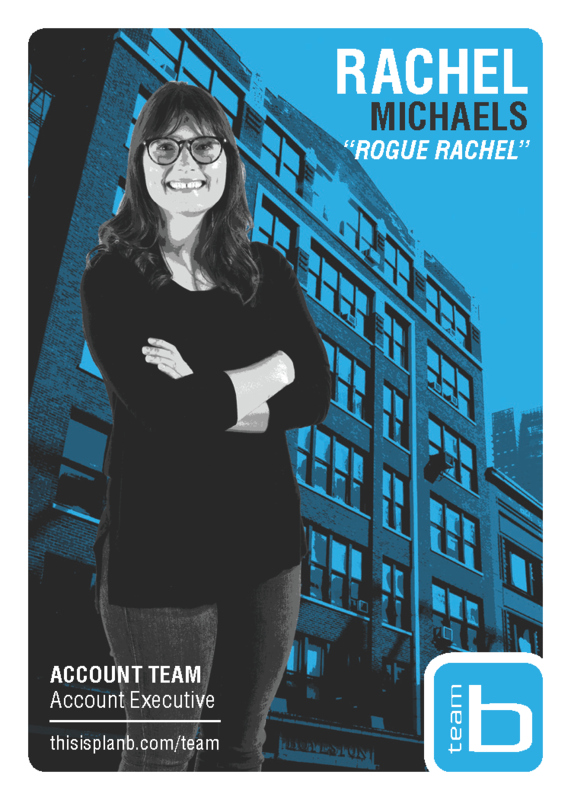 Rachel gained valuable experience in gathering market research and insights, collaborating with creatives, and strategizing projects against long-term business goals. At Plan B, Rachel works on Tandy Leather, Tru Vue, S&C Electric, and Alva Amco. She is passionate about building brands and is intuitive to client needs, using her exceptional organizational skills to ensure deadlines and deliverables are efficiently met. Rachel is a born-and-raised Midwesterner, having grown up in inner-city Chicago and attended the University of Missouri-Columbia. She loves to sail with her family when it’s nice out and to binge-watch Netflix when Lake Michigan freezes over.